Snooper Pantera GPS based speed camera detector provides advanced warnings of both fixed and mobile speed camera locations via the built-in GPS speed camera database. The GPS database updates are fed via the Snooper AURA database as a download from your PC. The budget Snooper Pantera is designed to be windscreen or dash mounted (dash mount is an optional extra) and a bright LED display and tone/voice alert provides all the warnings. Snooper Pantera has been discontinued. Looking for a speed camera detector with radar and laser detecton? The Snooper 4ZERO Elite BT features radar and laser detection. Accessories are still available for your Snooper Pantera here. 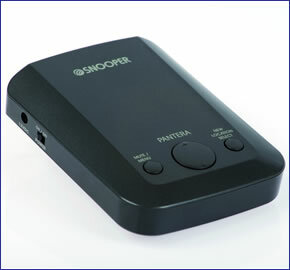 The budget Snooper Pantera speed camera detector uses the Snooper AURA GPS database to advise of approaching speed camera locations. Both voice/tones and the units LED text display relay the information to you as you drive - commencing from a maximum distance of 1000metres away to the camera and/or black spot hazard. When you are within a pre-selected range (100-1000metres) of a speed camera location the Snooper Pantera's bright dot matrix screen advises you of the type of camera you're approaching i.e. 'Truvelo', confirms the speed limit and then counts you down in increments of 50metres to the exact location. This is indicated by both the Pantera's screen and also via spoken voice alerts, allowing you to hear the information without the need to take your eyes off the road. Want radar and laser detection? Also available to buy is the Snooper 4ZERO Elite BT speed camera detector. The 4 ZERO Elite BT (pictured right) looks similar to the Pantera and provides the same GPS database based alerts as the Pantera, but in addition includes a radar and laser detector to detect live mobile camera sites. The Snooper Pantera, like all Snooper speed camera detectors, gets it speed camera data from the Snooper AURA speed camera database. The database provides advanced warnings to both fixed and mobile speed camera locations across the UK, Europe and in a growing number of other countries across the World. The database is constantly updated with the latest locations. Click here to read more about the AURA speed trap database. Do you have a question about the Snooper Pantera that's not been answered on this webpage? Please see our speed camera detector FAQs for questions from other customers and visitors. Plus if the answer to your question isn't featured, use the online form to ask us for the answer. Alternatively please telephone 01733 777623 Monday to Friday (9:30am-5:00pm) to speak to one of our sales team. Snooper Pantera can be installed in seconds and can be moved easily from vehicle to vehicle. Simply mount the Pantera on your vehicles windscreen with the mounting bracket provided. Power it from the cigarette lighter socket, switch it on and you're ready to go! Snooper Pantera provides advanced warning to fixed speed cameras such as Truvelo, Gatso, SPECS and mobile sites using Snooper's AURA speed trap database. Buy the Snooper Pantera from ActiveGPS and receive FREE lifetime speed camera updates worth £29.99 a year! It is fully legal to use a speed camera detector in the UK. However, before using the Snooper Pantera outside of the UK we STRONGLY RECOMMEND that you check to ensure that the use of a speed camera detector in other countries is also legal. The Snooper Pantera will only operate on Windows computers. Specifically, you must be using Windows XP (32 bit), Windows Vista, Windows 2000, Windows 7 or Windows 8 / 8.1. Additionally the software will only work with Internet Explorer 6 or Netscape Navigator 6 or above. The Snooper Pantera will not operate when using Windows 95, 98, 98SE, Millennium, Windows XP (64 bit) or Apple Macintosh operating systems. Want to add accessories to your Pantera? Though remember all the accessories listed above are included when you buy the snooper pantera from ActiveGPS. ‣Snooper Pantera manual - Please note: Snooper do NOT include a USB cable in the shrink sealed box despite listing it in the manual. However, we will include the correct type of USB Cable which will be packed with the Snooper box.